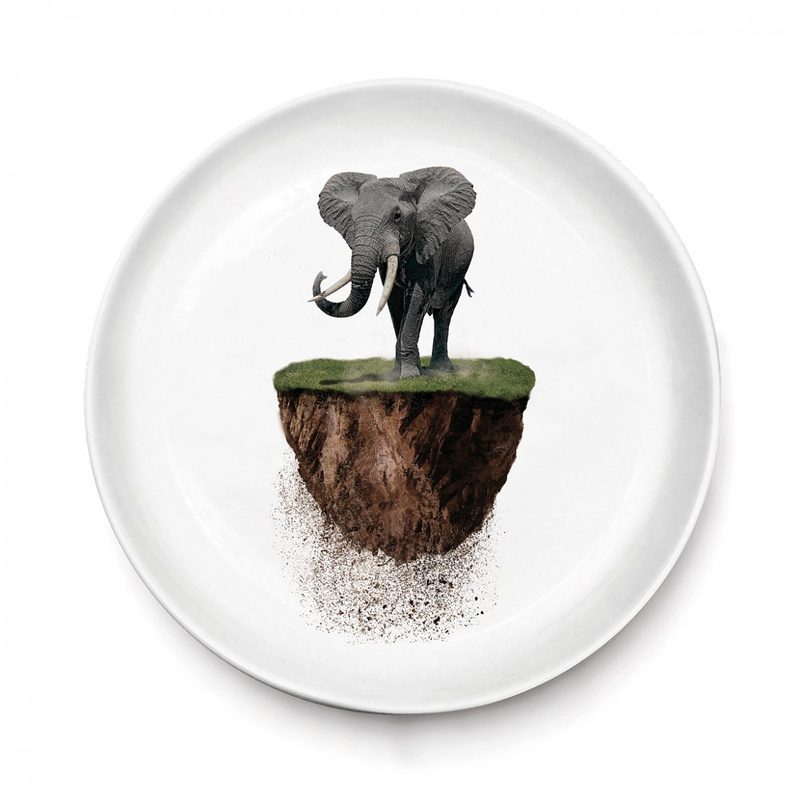 The Elephant Plate is one of the creations of the "You are not here" collection by brand SA13, a product line that has a very unique design with a precise and decorative identity. The unusual and eccentric representations that characterise this collection have a symbolic meaning, as they urge you to save that which is dear to you and keep it by your side. The drawing that embellishes the Elephant Plate depicts a big elephant on a small portion of land, an representation of an animal alongside a piece of its own habitat as if to take it away and bring it to a better place. The originality of this representation is the utmost, although it is also created using an extraordinary craftsmanship design. The proportions, the nuances, the attention to detail are all elements that make this representation a small work of art. The small pieces of land shown give off a pleasant sense of movement, just as if this big piece of land had been uprooted by a mysterious force to rescue the beautiful specimen. The Elephant plate is a Made in Italy product. SA13 is actually produced in the province of Vicenza, relying on the expert hands of its artisan collaborators. This SA13 plate’s design is made of high-end glazed ceramic, well-known for its surface elegance, having average dimensions that allow for very flexible use. Its diameter, in fact, is 24 cm. You can use this dish for very special hospitality service in the house, while still making for an object that can be used as a pure decorative item. It could be a wonderful idea, for example, to display the SA13 Elephant plate in the kitchen or other domestic settings such as inside a glass case, and placing this model alongside other glazed ceramic dishes from the same collection, as you can create a very original design corner that will certainly stand out. Usage: may not be used in the microwave. Wash at maximum 60 °C in dishwasher.